delightful family gatherings we have ever had. The dinner was beautiful and all enjoyed it. I have felt some better but did not dare eat much. We came home alone in time to do the evening work. Vene went with the Stevens. Saturday June 28th 1902 It rained nearly all day a cold ugly rain. I was about sick. my stomach hurts me the worst it has yet. I can't eat at all. Will went to town in the afternoon and got some medicine of Dr Moon for me. I ate a little supper and went to bed early. I kept a good fire all day. 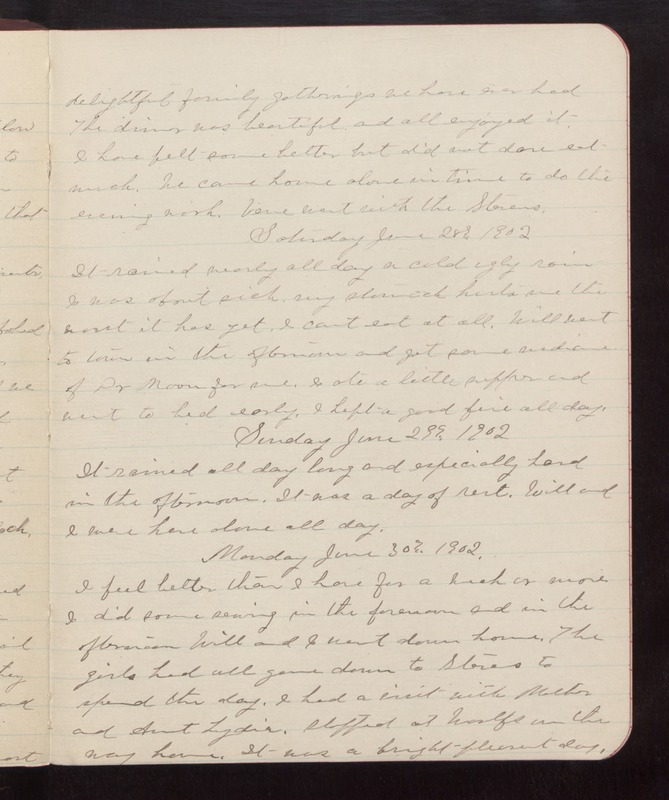 Sunday June 29th 1902 It rained all day long and especially hard in the afternoon. It was a day of rest. Will and I were here alone all day. Monday June 30th 1902 I feel better than I have for a week or more. I did some sewing in the forenoon and in the afternoon Will and I went down home. The girls had all gone down to Stevens to spend the day. I had a visit with Mother and Aunt Lydia. Stopped at Woolfs on the way home. It was a bright pleasant day.